The process I found a free dog-jacket pattern at sewing.circleofcrafters.com and printed the JPEG file. Per the instructions, I measured my dog’s chest and enlarged the pattern to fit by laying the original pattern on a piece of newsprint and tracing around it to create a larger version. 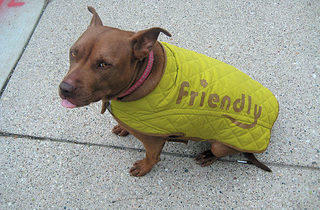 Then I strategically laid the pattern on the jacket’s back and sides and cut out the dog coat. To finish the raw edges, I salvaged the tan-colored binding that hemmed the jacket and machine sewed it onto the dog coat. I sewed on Velcro to fasten the coat around the neck and chest. 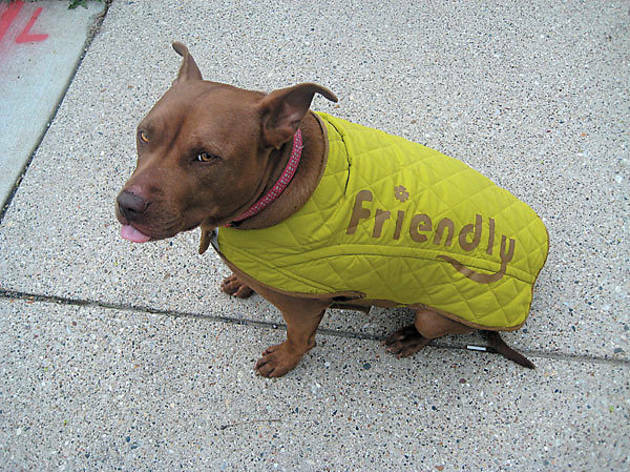 Lastly, I cut letters from the leftover jacket sleeves to embellish the coat and, at the same time, answer the protocol question to dog owners, “Is she friendly?” I ironed on the letters with fusible hem tape. —Collected and salvaged by Diana Durkes (finedivingchicago.com).